You may also go to our Home page and scroll to HotelWatch Security Updates for the latest security updates. Fort Worth Police have released the Most Wanted List as of 3/9/17. Make sure to click on the link below to view. Fort Worth Police have released the Most Wanted List as of 3/1/17. Make sure to click on the link below to view. Fort Worth Police have released the Most Wanted List as of 2/22/17. Make sure to click on the link below to view. Fort Worth Police have released the Most Wanted List as of 5/25/16. Make sure to click on the link below to view. Fort Worth Police have released the Most Wanted List as of 4/20/16. Make sure to click on the link below to view. Fort Worth Police Department has created a brochure about Panhandling. Please print and keep at the front desk. The FWPD has advised to call in any panhandler, because usually that panhandler can lead them to other crimes. Also below is information about the latest Downtown Fort Worth Burglary Vehicle Suspects, and areas in Downtown that have experienced a BMV. Here are a couple of checklist you can pass out to your staff to be prepared when seeing any suspicious activity at your hotel. If completed correctly, they will help your local police in tracking that person down. Fort Worth Police detectives are asking for public assistance in identifying a package thief. On February 19, at 6 p.m., a male was caught on video going to the front door of a residence and stealing a mail package. 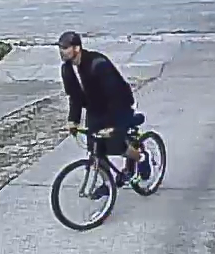 The man is seen riding his bicycle while committing the theft. The suspect is white, 30-35 years old, approximately 6 feet tall, and was wearing dark colored shorts, a black jacket, and a baseball cap. Photos of the suspect can be seen below. Anyone with information on this suspect is asked to contact detectives at 817-392-4715. The following persons are wanted for the listed offense. The warrants were valid as of February 17, 2016 at approximately 1530 hours verified by the Fort Worth Police and the Tarrant County Sheriff’s Department. All warrants should be confirmed prior to arrest. 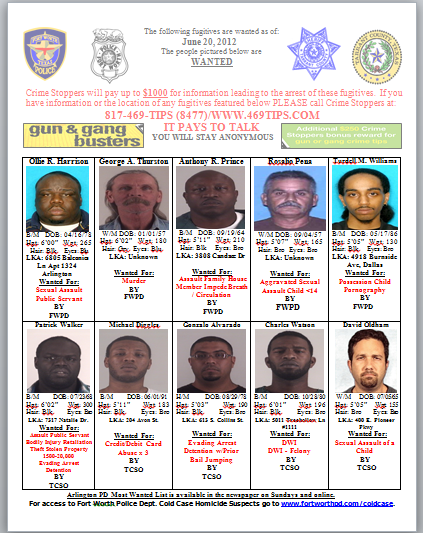 FWPD/TCSO’s Top Ten Most Wanted Fugitive Flyer is available in the Star-Telegram Newspaper on Monday’s publication and online, in the Busted publication and on line: www.bustedmugshots.com., and the weekly shopper Thrifty Nickel Ads of Fort Worth; website: www.thriftynickelDFW.com. 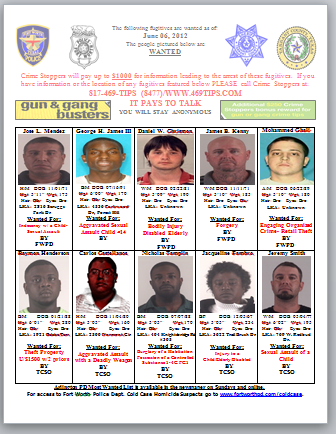 Arlington PD’s Top Ten Most Wanted Fugitive Flyer is available in the Star-Telegram Newspaper on Wednesday’s and online. Thank you! Within the last few days, several hotels in the DFW Airport South area experienced a robbery at gun point. The suspect is a BM. He entered the hotel to the Front Desk and demanded money from the Front Desk Agent. The suspect also robbed several Guest as they were walking into the lobby. Irving PD has not apprehended the suspect yet. Please discuss with your staff a plan of action if this may happen to them, and to be on the lookout. Please be on the lookout & help the Arlington Police with a vehicle break-in and theft on 4/20. Suspect has not been found. The report read as follows: Sometime early morning on 04/20/15, unknown suspects forced entry through the passenger side window of 2014 Chevrolet PK parked in a Hotel parking lot off of Hwy. 360 near Six Flags in Arlington. Included in the property stolen was a credit card used at Wal-Mart, 7451 McCart Ave. in Fort Worth. Video surveillance captured the pictured female to have committed the unauthorized transaction. Any assistance in identifying her would be appreciated. The female arrived and left in the pictured vehicle. Fort Worth Police Department is asking you to be on the lookout for 2 suspects, a white male and a white female. They stole a victim’s purse out of their card that was parked in the garage. They have used the victim’s credit cards all over Fort Worth. Click on the link below to see pictures of the suspects. If you see someone matching the description, please contact Detective Kenjura at 817-392-4622. This has been verified by the FBI (their link is also included below). Please pass this on to everyone in your email address book. It is spreading fast so be prepared should you get this call. Most of us take those summons for jury duty seriously, but enough people skip out on their civic duty that a new and ominous kind of fraud has surfaced. The fraud has been reported so far in 11 states, including Oklahoma , Illinois, and Colorado. This (swindle) is particularly insidious because they use intimidation over the phone to try to bully people into giving information by pretending they are with the court system.